Local self-parking lots are also easily accessible. 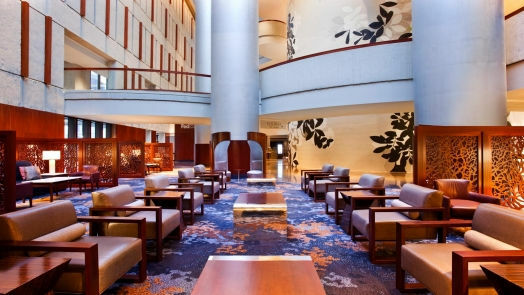 The hotel is located on the MARTA line at Peachtree Center Station — one block walking distance from the hotel. Fee: $35 flat rate for one passenger, plus $2 per additional passenger. An additional fee may apply for excessive luggage. Now you can earn 1 Starpoint for every U.S. dollar you spend with Uber®, and earn even more Starpoints® during your stays with SPG®. Just link your SPG and Uber accounts at spg.com/uber. If you’re not signed up for Uber, you can do so at spg.com/uber and receive a new-member credit toward your first ride. Get in and ride to rewards! Take Interstate 20 West into Downtown. Connect onto Interstate 75/85 North. Turn left onto Andrew Young International Boulevard. Proceed west 5 blocks from the interstate. The hotel is located on the left at the corner of Andrew Young International Boulevard and Peachtree Street. Take Interstate 75/Interstate 85 South. Take Exit 249A (Courtland Street). Proceed to the third light. Turn right onto Andrew Young International Boulevard. Travel three blocks, crossing over Peachtree Street. Take Interstate 20 East into Downtown. Take Interstate 75/Interstate 85 North to Exit 248C. Proceed west 5 blocks from the interstate crossing over Peachtree Street.